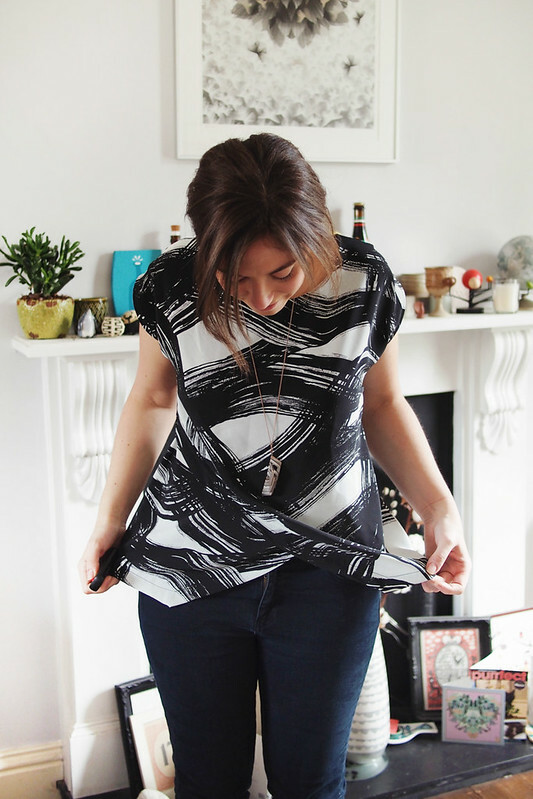 Thanks for your comments on the last post, really interesting to read about how everyone else got into sewing! 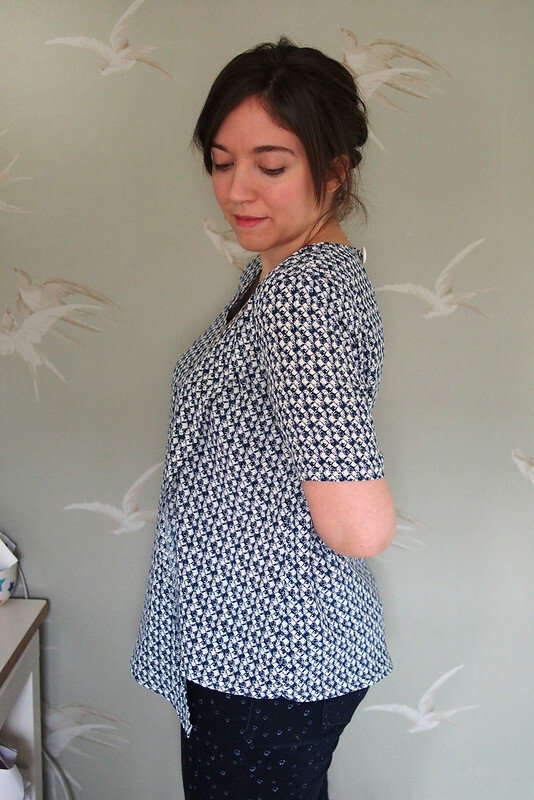 So, I’m proud of myself here: I made a top when I had ample fabric to make a dress instead. I’ve mentioned before that I have a weird tendency to feel like I need to make a dress when I have enough fabric to do so, so it’s a real internal struggle to ever make ‘just a top’ from a 2m length of fabric. SILLY. Anyway. 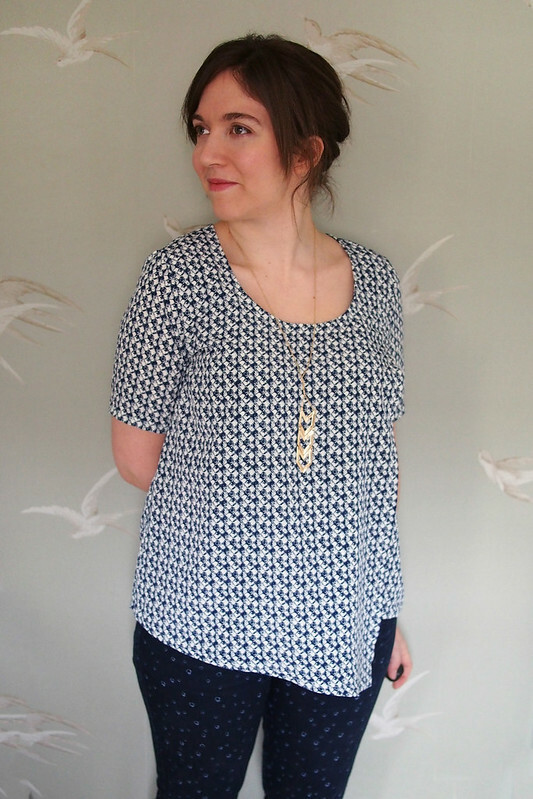 This is a Style Arc Fern top, which came to me because Amy got it as her order freebie and kindly sent it on to me. It’s a rather cool kimono-sleeved top with a double-layered front which end in mitred corners. A bit of an update on the Elizabeth that I’ve sewn a couple of times already. The fabric’s a cheap polyester crepe from eBay, which is why I didn’t mind sacrificing it to a top instead of making a frock. It’s been said before about Style Arc: the styles and drafting are amazing; the instructions are diametrically terrible. Now I don’t mind minimal instructions but Style Arc ones seem to be written purely to fox you, with terminology frequently mixed up or flat-out wrong (‘stay stitch’ is used interchangeably with understitch and baste in this case) and pointers to refer to diagrams that really don’t make things any clearer. This top has a few interesting details which meant I was puzzling over the construction quite a bit. There’s the mitred seam at the centre fronts, which took a few minutes of head-scratching to figure out but turned out to be quite a neat method to get a sharp corner. The front neckline is finished by sewing the overlapping fronts RS to WS and flipping over, while the back neck is finished with a facing. To get a clean finish at the neck edge you sew the outer front layer’s shoulder to the back shoulder RS together, then continue to sew the inner front shoulder to the back facing. Makes sense NOW but very much didn’t at the time. Also if your fabric looks similar on the back like mine does, mark which is the front or you might sew the shoulder inside out first try. Ahem. 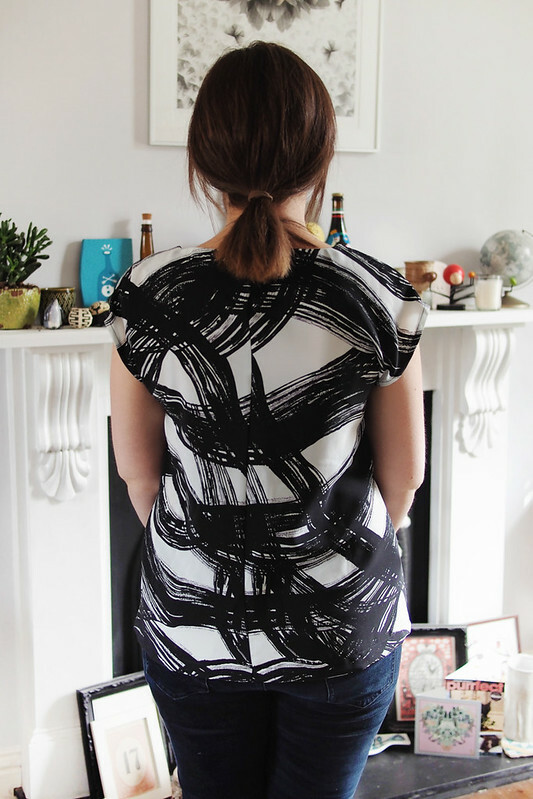 There’s supposed to be a little keyhole split at the top of the back neck: I had a valiant stab at it but had to give up and sew it shut as I simply couldn’t get it looking right by following the directions. After that I gave up with the instructions entirely and made the rest up as best I could. Can’t argue with the fit though, which is perfect right off the pattern. The shoulders of SA patterns seem to fit particularly nicely on me and the length, darts, neckline etc are all just so. 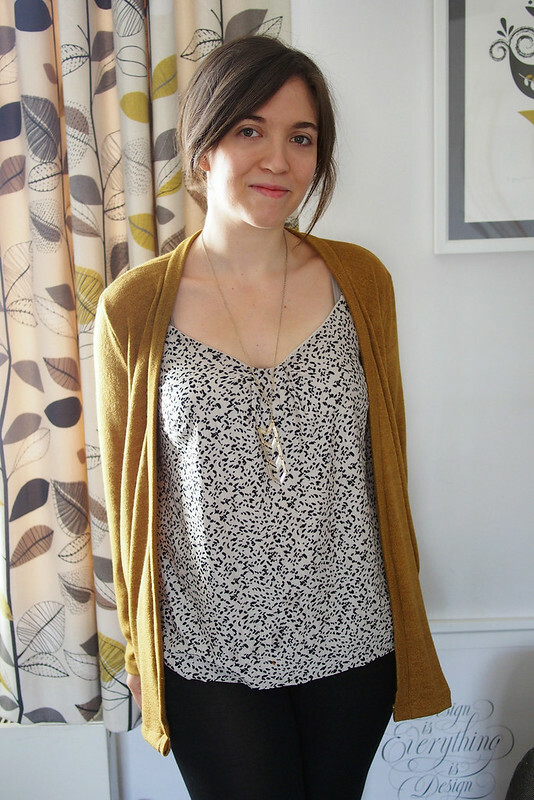 It’s a really useful, wearable top, great for work with skinny jeans. I suppose I’ll just have to muddle through and make another one some time! 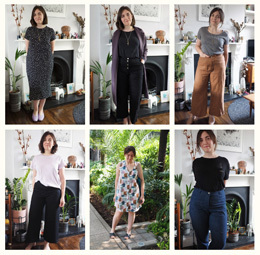 The weather has been so uncharacteristically lovely in London that it’s really hard to start thinking of autumn sewing – I haven’t even packed away the summer dresses just yet as it’s still in the low 20s (70s to you ‘mericans). Nonetheless I have started identifying wardrobe gaps and sewing up some things to cover them. 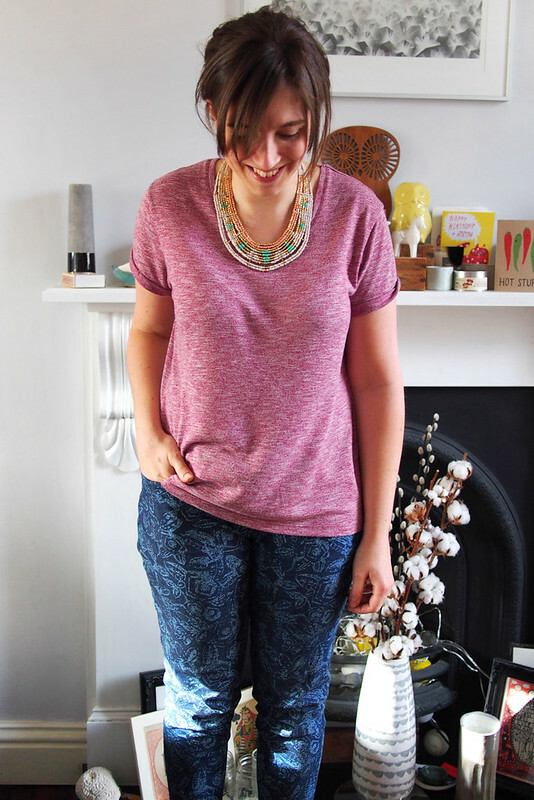 I think this outfit is basically what I’ll be wearing from November til April: a Tilly Coco with Style Arc skinny jeans. 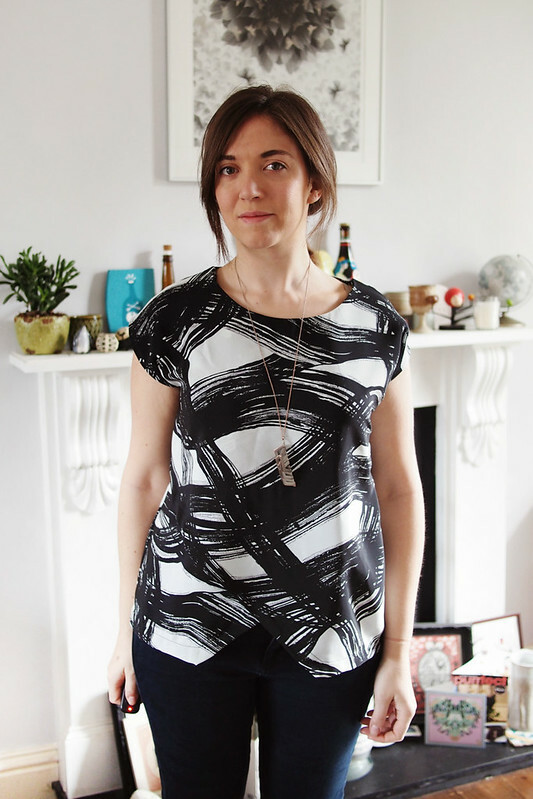 The Coco first: I cut a size up from my previous ones for a more slouchy feel, teamed with the three-quarter sleeves and an added draped front pocket (cut with sloped sides but sewn in a straight vertical line, if that makes sense). The fabric is a stashed remnant of a fairly thick, very stretchy jersey. It’s all overlocked together and the hems are all just turned back and stitched with lightning stitch: a two hour jobby. 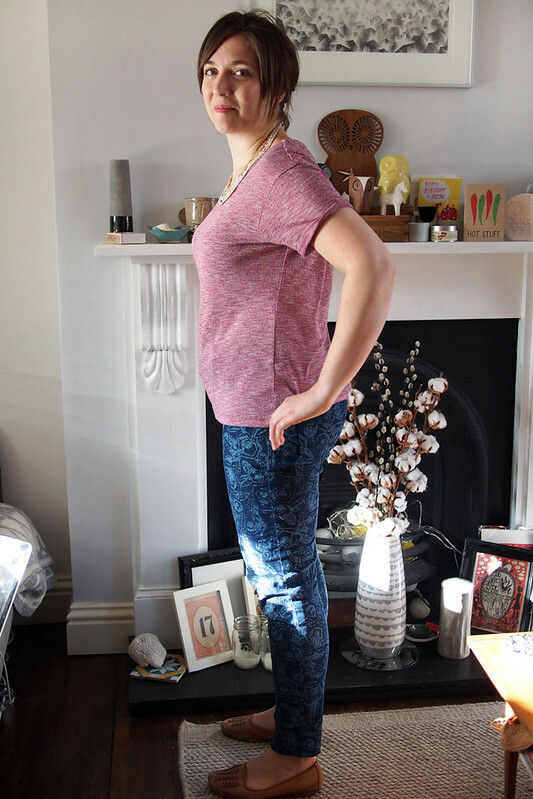 The jeans are my third go at the Stye Arc Sandra – after a too tight and too loose pair, these are pretty great. I made up them in a brownish stretch denim I got in Ecuador. The sewing process, to be honest, was not particularly fun. The fabric didn’t want to press at all and topstitching was painful… I tried using a proper topstitch thread and needle and it wasn’t happening at all. Don’t even talk about twin needling. Hence the topstitched detailing ended up pretty, ah, minimal – I didn’t even do the leg or crotch seams, and the waistband is stitched with non-matching regular thread. Meh. The fit around the waist and hips is great, but there are some odd drag lines going on around the back knee. Honestly, you fix one problem and another pops up. 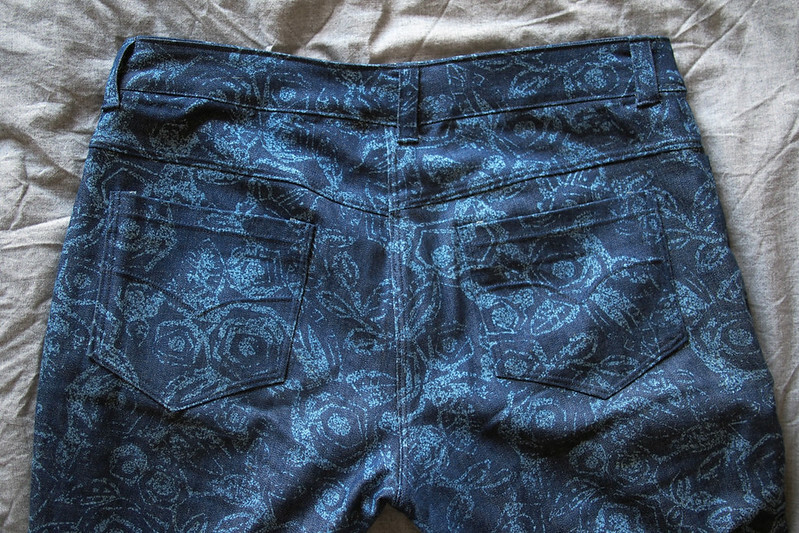 I was determined to get a really nice non-sagging, non-creasing waistband this time. I interfaced both the inner and outer bands with a good quality medium/heavy interfacing from Ray Stitch which seems to have done the trick. The one bit I often seem to mess up is the very centre of the waistband ‘winging’ upwards at the top corner, creating a messy overlap when buttoned. Hence I added two buttons to keep it from flapping. 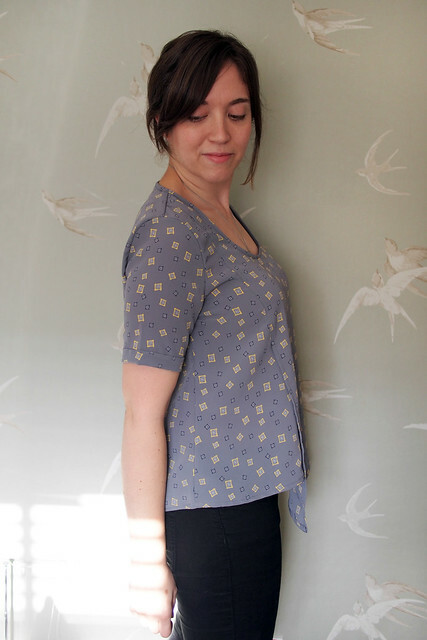 The front fly is my tidiest yet; I incorporated the fly facings onto the front pattern pieces and used the directions from Burda 7017 which are definitely my favourite (though I’ve been meaning to try this method which looks even easier). 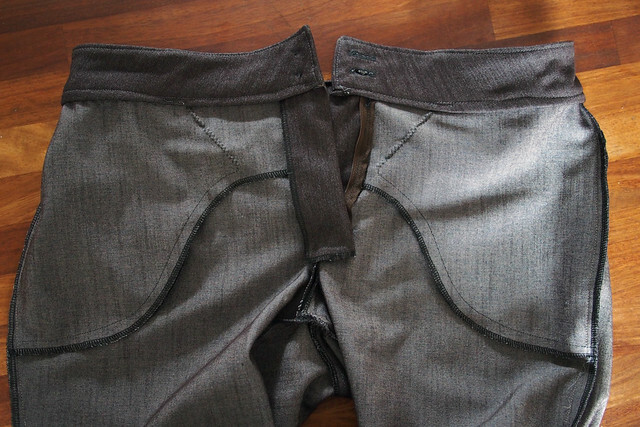 I even managed to correctly sew the pocket yokes into a Spanx-style extension that goes all the way to the zip. 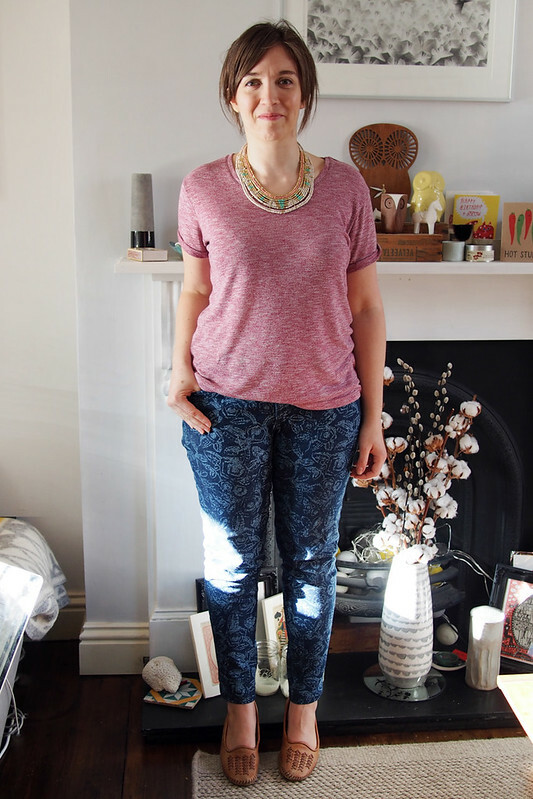 It’s been nice to dip back into jeans-making after a spate of sewing frocks. I need to bash out a couple more pairs as I’ve chucked out all my ill-fitting RTW ones! 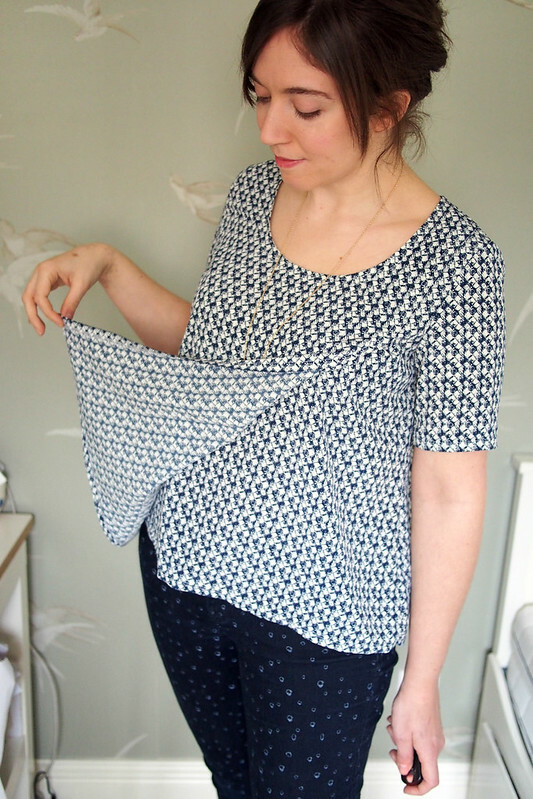 Just a quick one, a fun Friday afternoon sew to wear this weekend! 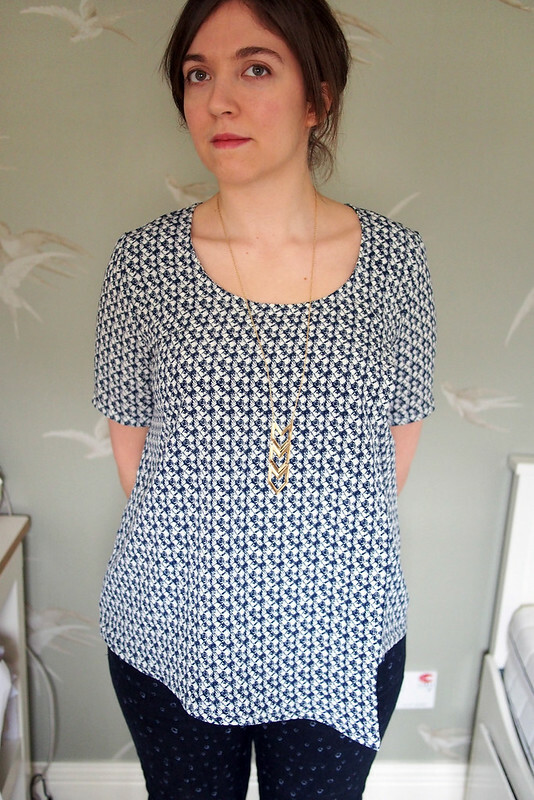 This is my second version of the Style Arc Elizabeth top (here’s the first). 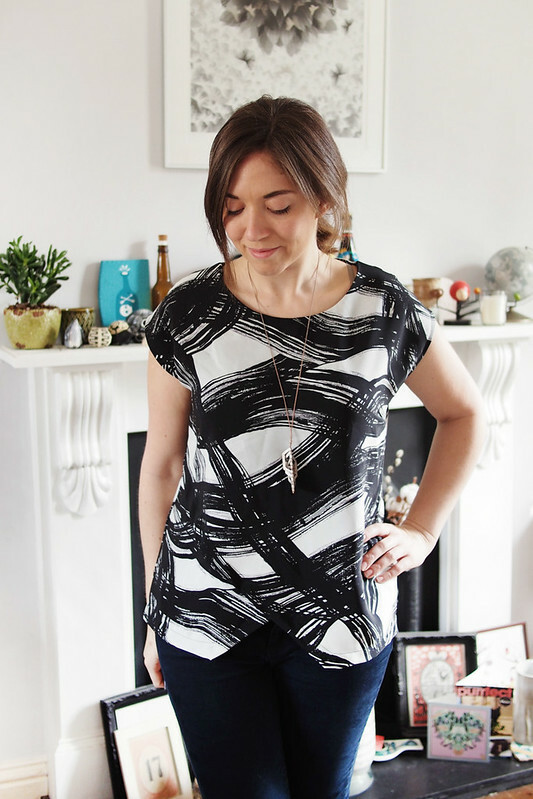 I don’t have much else to say about the pattern – it’s a great fit on me and the crossover front makes it just a bit more interesting to sew and wear than a regular woven tee. This time I shortened the body by about an inch all round and scooped out the neck even more, just for a slightly different look. This rad fabric came via eBay for just £2! 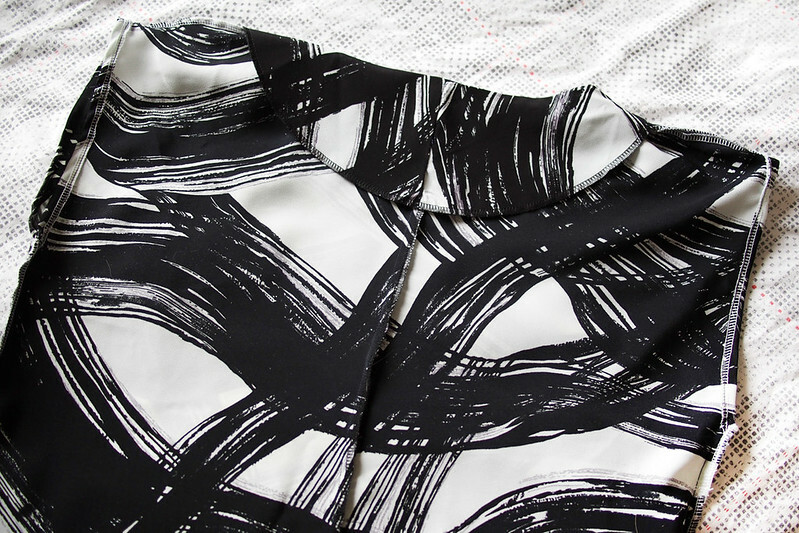 – it’s a poly crepe de chine and the pattern reminds me of an 80s duvet cover pattern. It was definitely earmarked for a top as I think it’d be a bit much for an all-over dress print. The neckline is finished with bias, and you can see here I’ve tacked down the top layer using a parallel line of stitching, to just below the bust. The sleeve cuffs are pressed to the front and hand-slipstitched down, and it’s all French seamed. Yummy. I finished it in one session today and now we’re off to the cinema together. Happy weekend all! 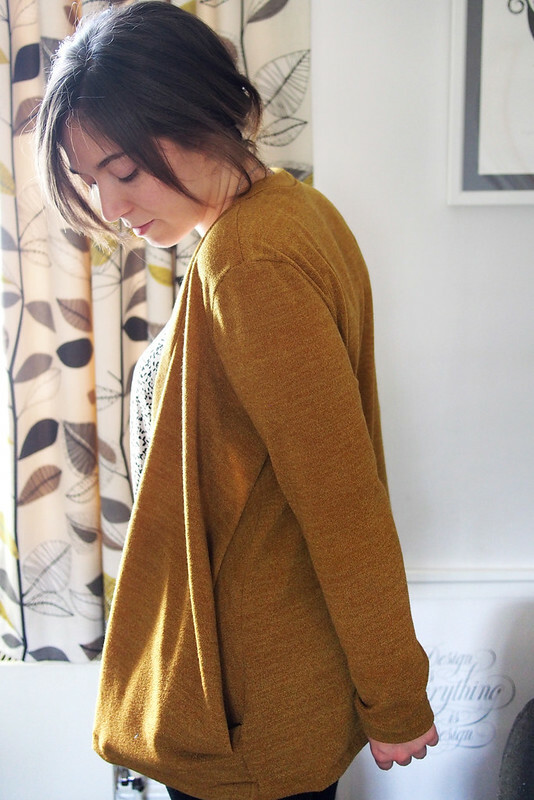 I’m very behind on photographing and sharing finished projects again (the old work effect, sigh), so this snuggly cardi is no longer very seasonally appropriate thanks to the lovely London sun we’ve been having lately. But it’s still a handy wardrobe builder and great for throwing over a dress or cami when the temperature dips. 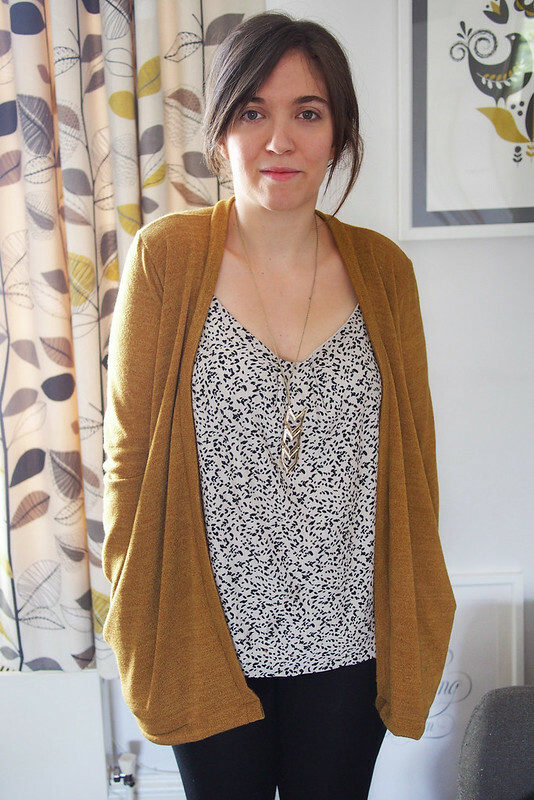 It’s a Style Arc Simone cardigan in Warm Jersey, which was kindly sent to me by White Tree Fabrics. I was going to make another Julia initially but decided to try the Simone, mostly because pockets. I’m – eh – moderately happy with the pattern. 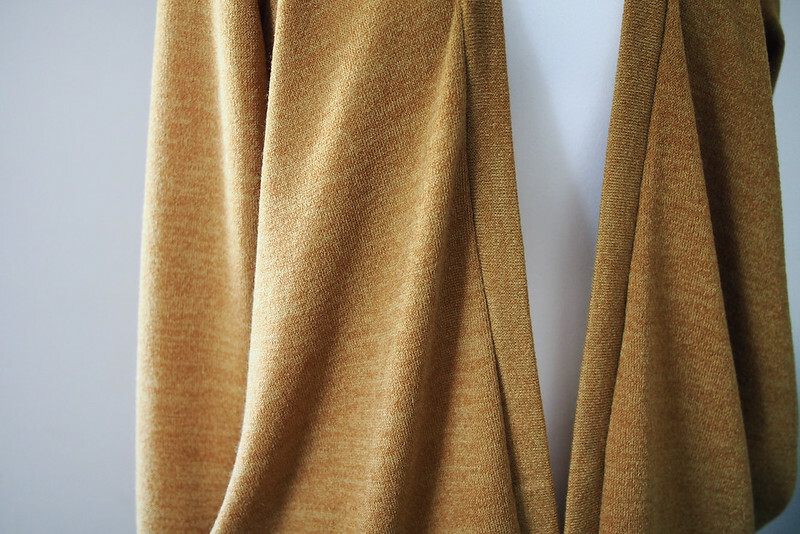 I agree mostly with this Pattern Review post that the drape is not like how I expected from the diagram. 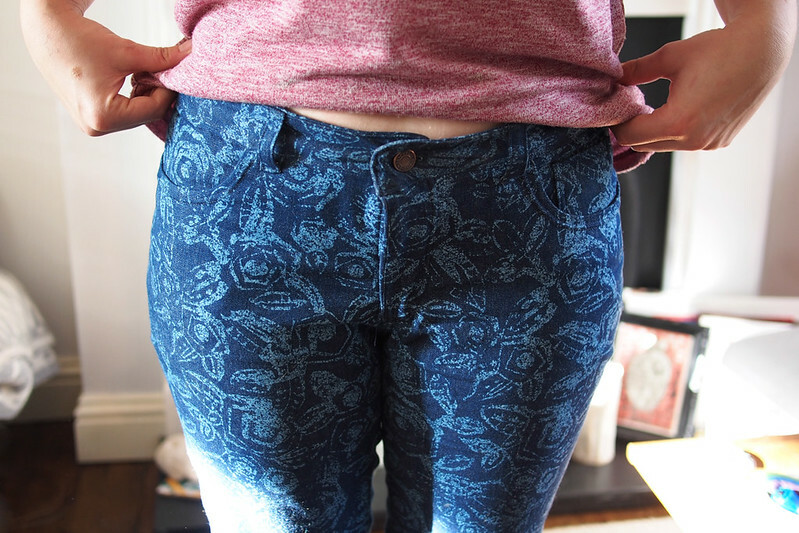 It hangs very heavily and rather sticks out around the hips, one place where I really don’t need any extra weight! The pockets are made by sewing a large dart in the front then folding it to the side seam, so you have six layers folded up in the hem which obviously makes it quite bulky. A lighter knit that the one I used is recommended, so maybe that would help. The instructions are typically brief but easy enough. There’s one error to be aware of: you need to cut two neck binding bands and seam them at the CB (the instructions have you cut only one which obviously isn’t long enough). Chunky pockets aside, the fit it pretty good. It’s a bit longer than I expected, ending below the bum on me when I was hoping for mid-hip. You can’t shorten it from the hem because of the pockets, so next time I would take a couple of inches length out from around the waistline. The Warm Jersey fabric is a finely-knitted poly/elastane mix with a heathered effect from different coloured strands. Isn’t the colour just gorgeous? It matches both my living room and my blog! It comes in more scrummy muted colours too – red, brown, grey, blue (and Erin just used the richer aubergine purple for a hoodie). 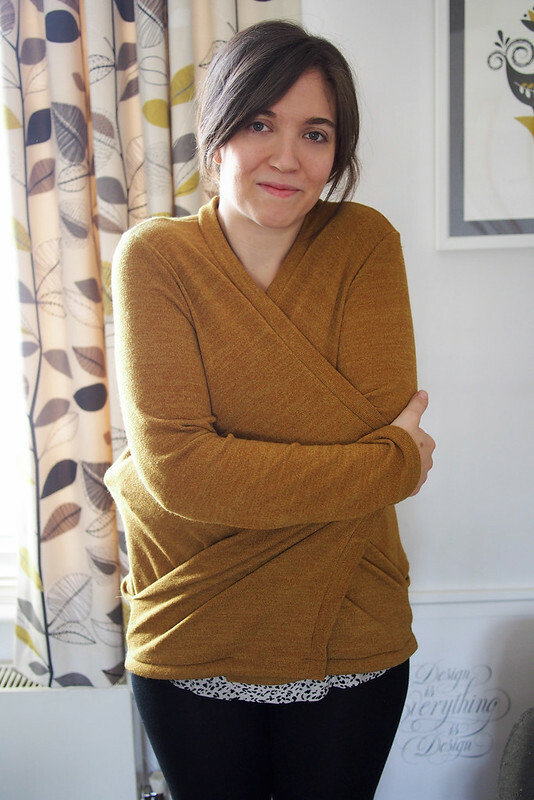 As the name suggests, it’s very soft and cosy and has a beautiful drape. I definitely snuggled in it like a blanket while deciding what to make it into. It was also great to work with – my overlocker and sewing machine both loved it. Despite being a proper knitted-looking knit it doesn’t fray or get fluff everywhere and it’s sturdy enough to not stretch all over the place when being cut and stitched. The fabric behaved beautifully for the neck binding and I love how polished it looks – almost like a slim blazer lapel. There’s clear elastic in the shoulder seam to support the weight. 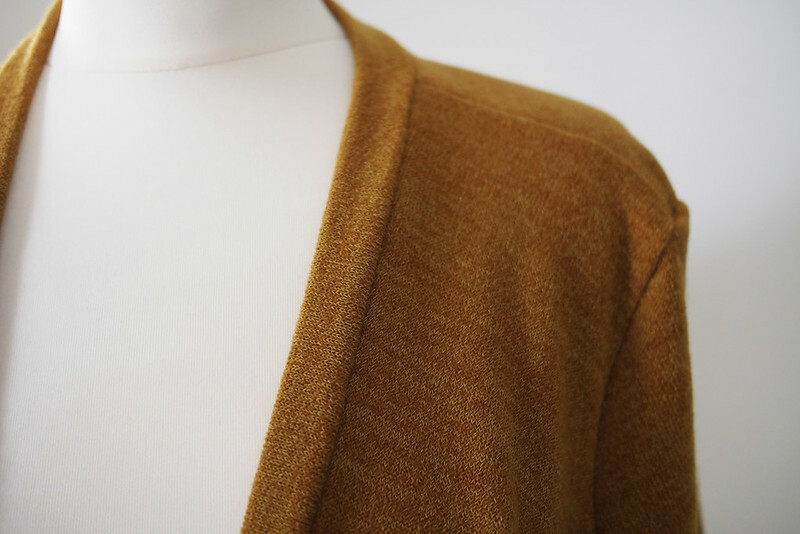 One more change I would make next time is to hem the main cardigan before adding the neckband with the short edges pre-finished, because it feels a bit odd to me to have the hem going right over the band. I think it looks best on me with the pockets shoved to the back, not hanging around the front in its slightly weird trapezium-shaped way. It will definitely get plenty of wear this summer and beyond, and I might make it again with the fitting tweaks I mentioned as I do like the style. Obviously, the grey warm jersey is calling my name for next time. 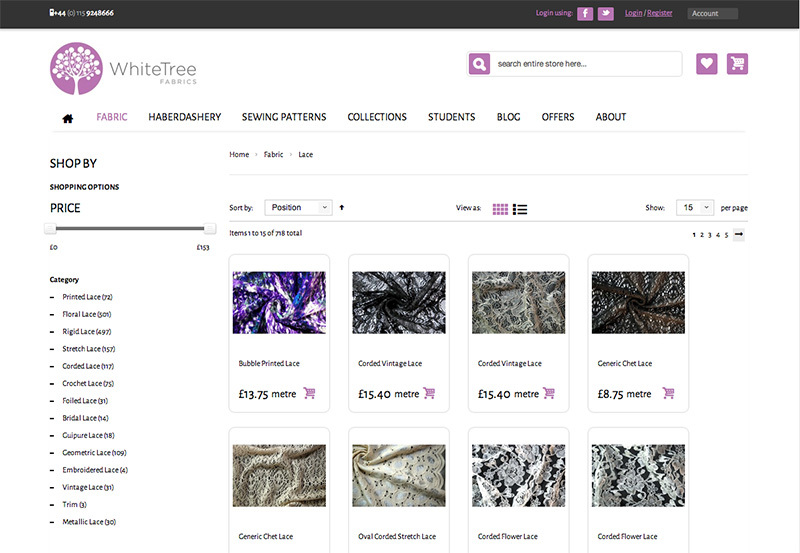 Thank you to White Tree Fabrics for supplying the fabric; views as ever my own. 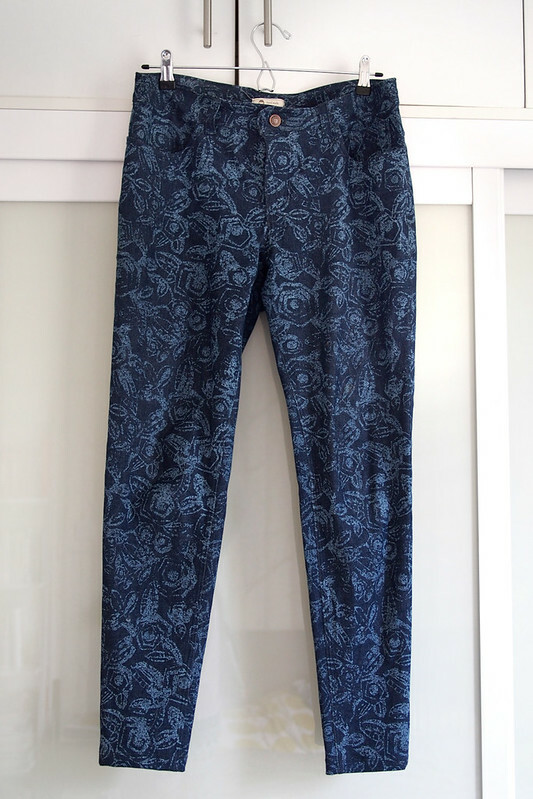 Here’s that second draft of Style Arc’s Sandra jeans I mentioned. They still aren’t perfect fit-wise but they are much closer and much better constructed. I’ve been wearing these pretty solidly since I finished them, especially since I shrunk my favourite RTW Gap pair in the wash recently. 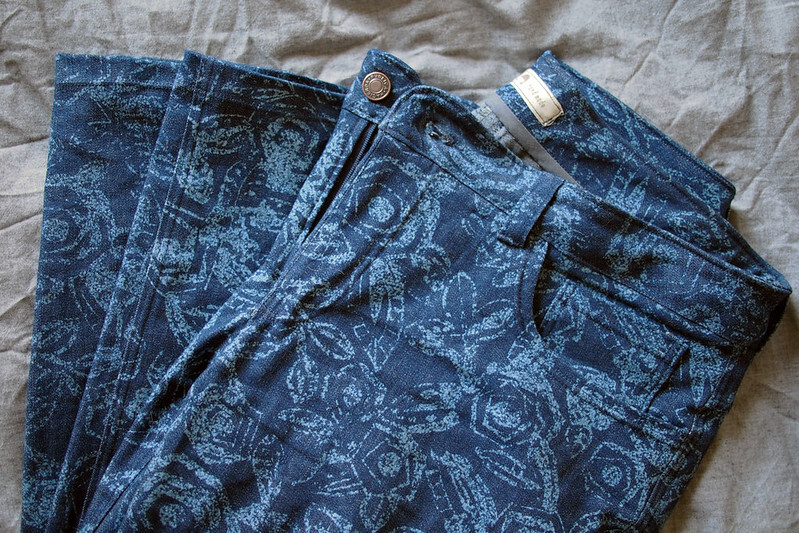 For this pair I used a stretch denim in a pretty abstract rose print from Rolls & Rems. It was £5.50 per metre and it’s quite thin with a generous amount of two-way stretch. I started with my already-adjusted Style Arc Sandra pattern, but bearing in mind my fit issues from last time and also that I was using a stretch this time I made a few further adjustments. 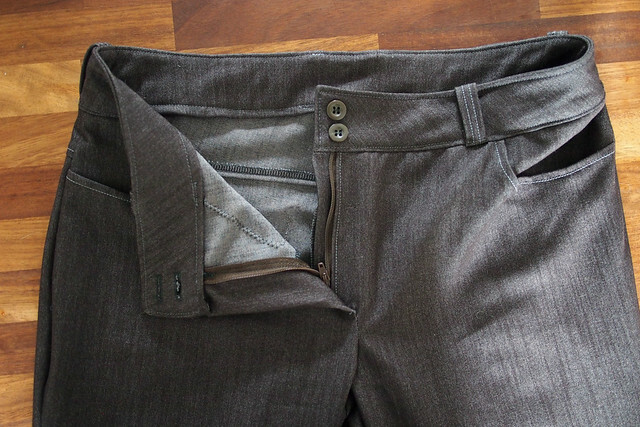 The fit came out completely different to the first pair – it just shows how much effect the stretch factor has. I was able to taper the legs way in for a skinnier silhouette, and I added a bit more hip ease to compensate for the first pair being too tight around there. They’re way more comfortable, almost with legging-type ease of movement. I cut the leg length right on the ankle for a nice springlike look with flats. They came together pretty smoothly. 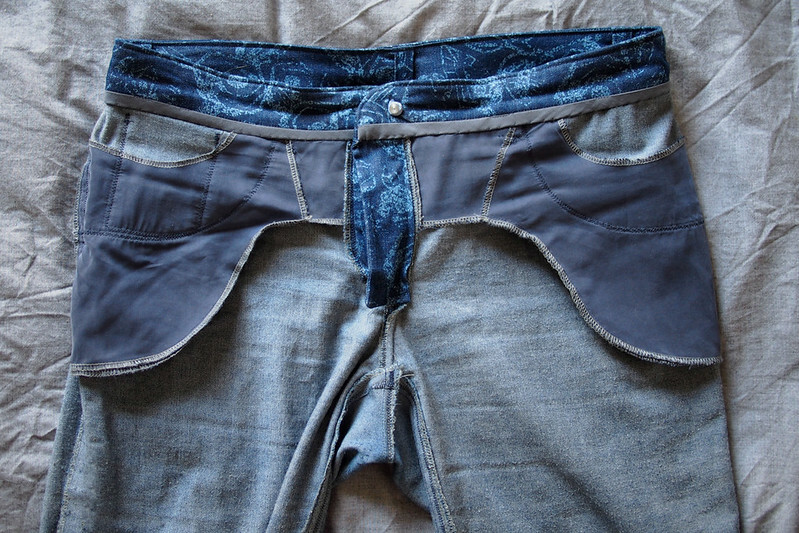 I didn’t have any additional trouble from using a stretch denim. I used a universal needle for most of it, a stretch twin needle for topstitching, and a denim needle for the many layers of the waistband. I used regular thread again, not topstitching, mostly because I was too lazy to go and buy some and have to change thread all the time. I do think a contrast pale blue would have been cute on this pair. No gasping strain lines this time! 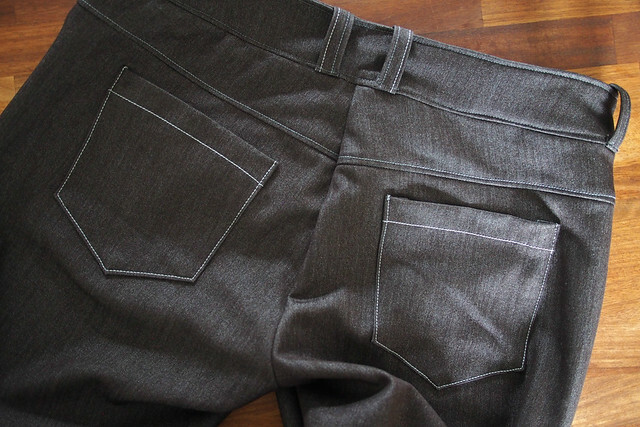 The waistband, however, was an extra challenge to get right in stretch denim. 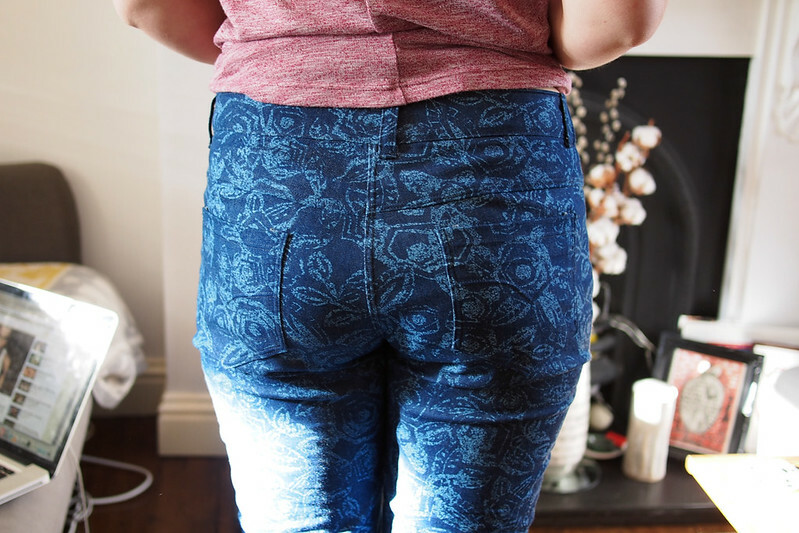 I had a *massive* gape at the centre back, probably due to adding the hip ease and needing to pinch it back out towards the waist. After about 5 or 6 failures, I ended up drafting a four-piece band instead of the continuous one of the pattern, in order to ease out the excess through angling the seams. I also interfaced the inner waistband to prevent it from bagging out over time, although it actually has stretched out a bit anyway and they’re a bit too big now. 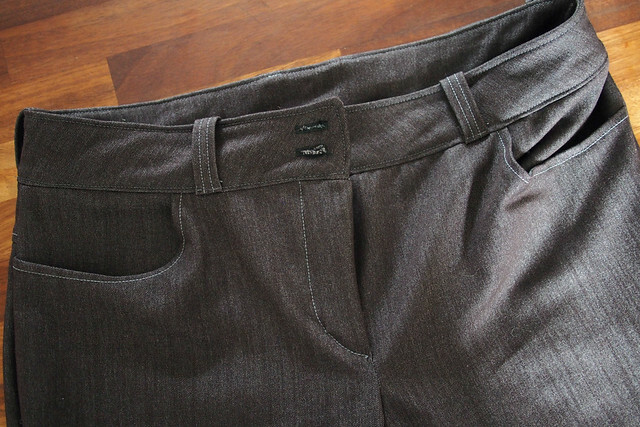 It’s also got quite creased as you can see – I think I might hunt out some special waistband interfacing for the next pair. The guts are much neater than my first pair. After cutting all the pieces I spent a really boring hour finishing every single raw edge on the overlocker so it was out of the way when I came to sew. 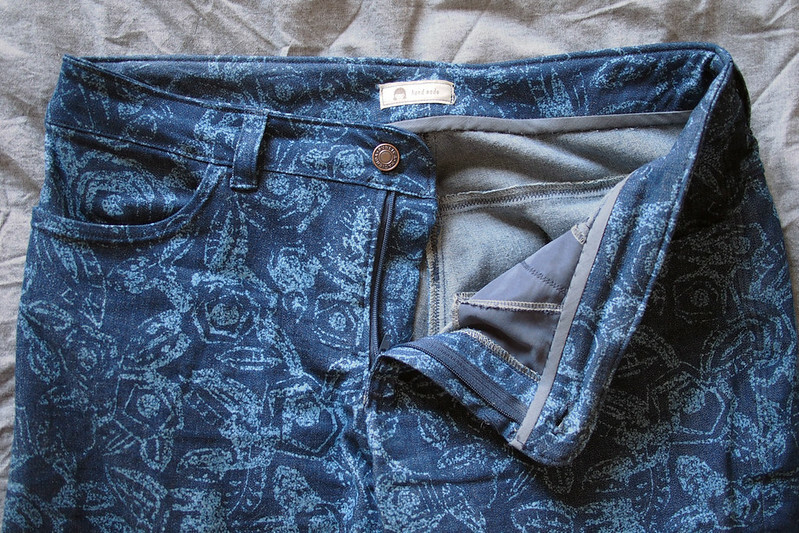 I reduced the size of the fly shield as it was originally kind of bulky compared to my RTW jeans. I also bias-bound and hand-slipstitched down the inner waistband. Tidy. 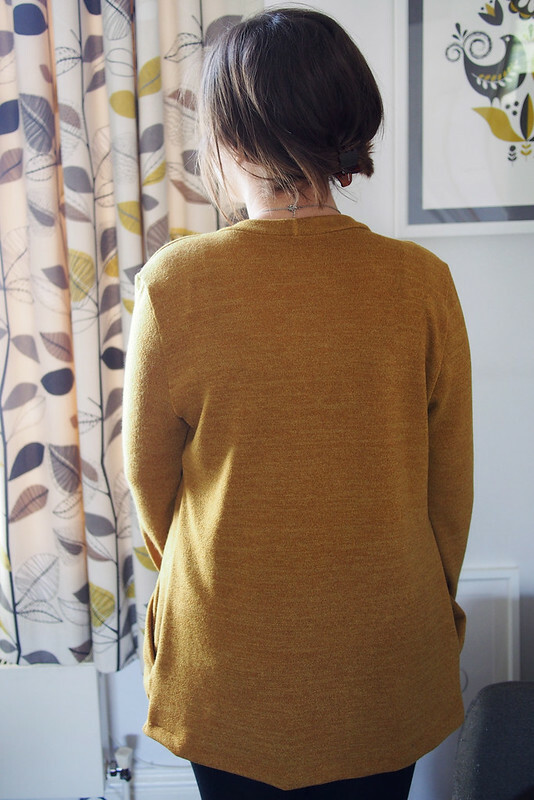 After my month-long dalliance with knits, I swung backs to wovens at the weekend. I find each one makes me appreciate the strengths of the other: the speed of fluid knits vs the accuracy of sturdy wovens. Both good fun in their own ways. 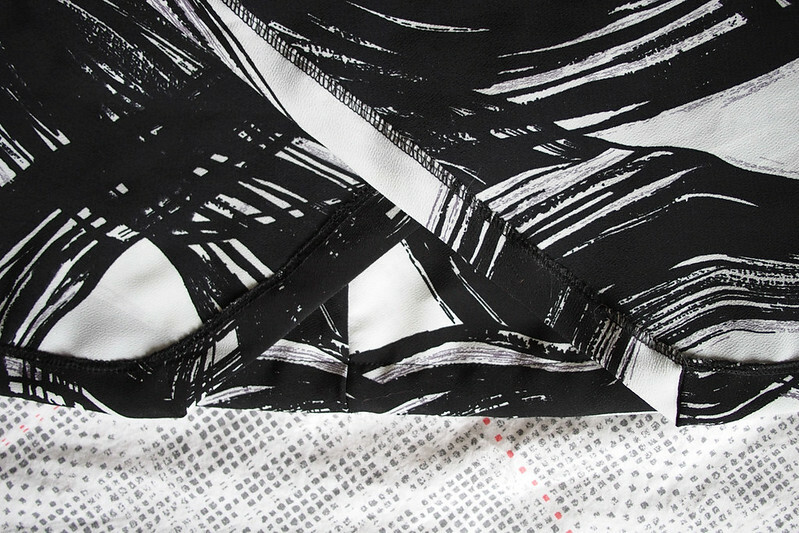 Talking of fabrics first, this gorgeous crepe de chine was kindly sent to me by Sam via the Stash Diet swapping group on Flickr. What a great idea, eh? I’ve sent out several bits of fabric and yarn (I have some left, check the group!) and received back this lovely stuff and some new-to-me patterns. Thank you Sam and I hope you approve of what I did with it! 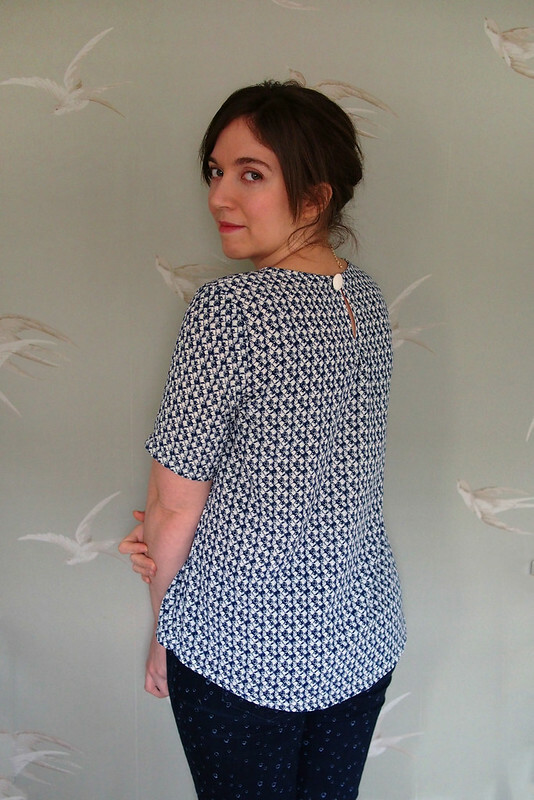 The pattern I used is the Elizabeth top from Style Arc, an Australian company who also sell their patterns to big retail stores like Asos. In general I’d say that they are geared toward the more advanced sewist, as the instructions for both patterns I bought are somewhat scarce. Very little guidance is given on things like seam finishes and construction methods, so a bit of prior knowledge and common sense is a must. But the trade-off is you get extremely good drafting, great style lines, and a very RTW type look to their garments. And for this pattern anyway, it was easy enough to figure out the construction steps without much help. 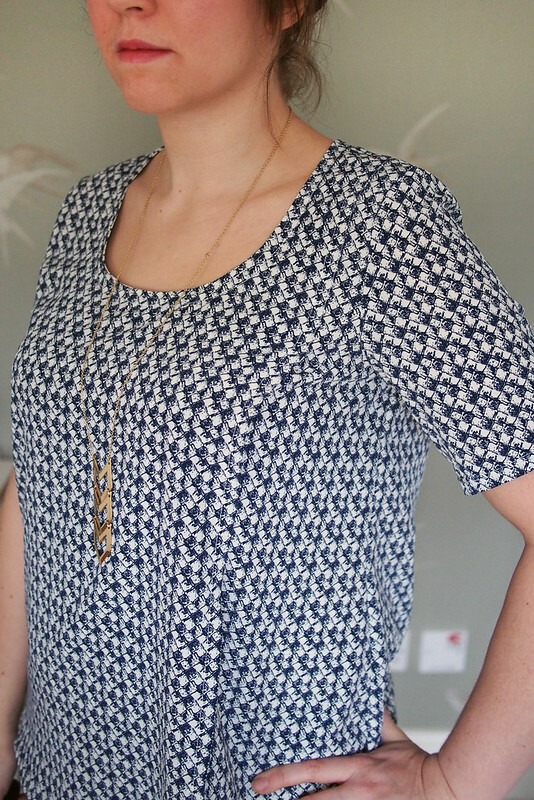 My aim was to create something similar to my silk tulip-front Scout, which is definitely my most-worn woven top. 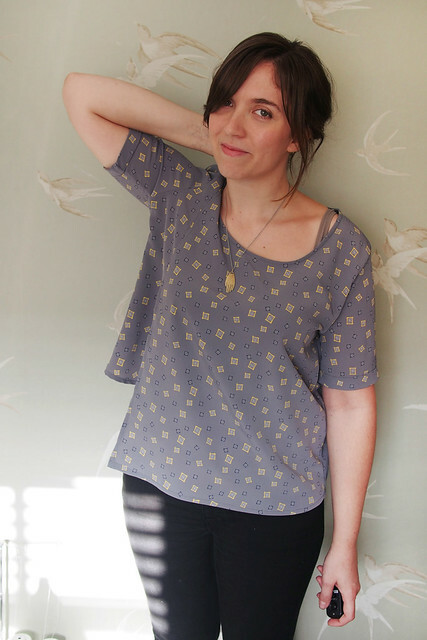 I think this ticks a lot of the same boxes: graphic print in muted colours, luxe yet easy to wear (and sew) fabric, comfortable shape while still looking like I’ve made a bit more of an effort that just wearing a plain tee. Mission accomplished, I think. As I said, the drafting and the fit of this pattern are great. I made no fitting modifications besides lowering the neckline quite a bit. 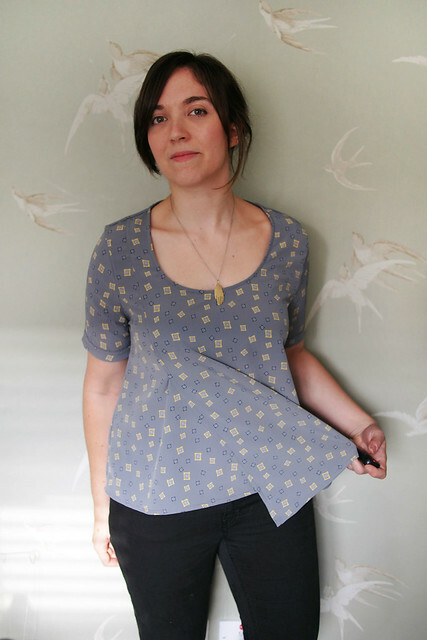 I especially like the slim ‘longer-than-short’ sleeves and the subtle asymmetry at the hem. The under layer covers pretty much the whole torso so there’s no risk of it flying open. There’s a little keyhole at the back neck, which I finished with a comedy giant button. 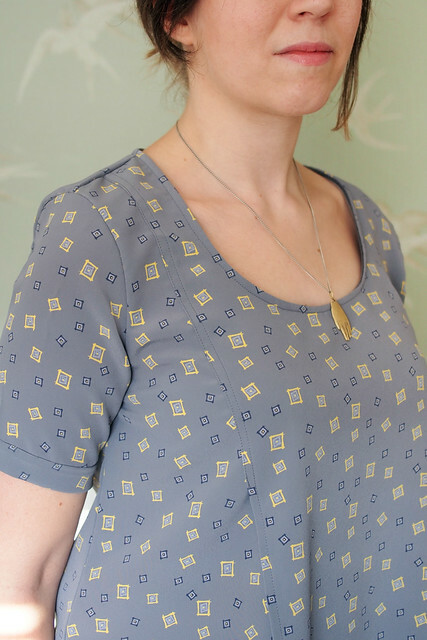 The rest of the neckline is finished with self-fabric bias, and I used a twin needle throughout on the hems. This pattern works in a knit or woven, so I think I’ll be making up more versions sometime – check out Sally’s sweet striped jersey one!